Home > What Are Opening Statements? Opening statements in the Commonwealth of Massachusetts are statements made by an attorney representing an injured party in a trial. 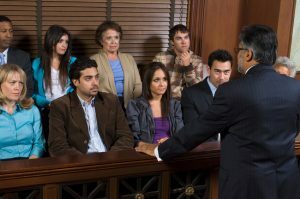 An opening statement is very important because it is the first opportunity that an injured party has to present to the jury their claim. Some attorneys consider an opening statement to be a roadmap of the claim, or an outline as to anticipated testimony. It is not the time in which a case is argued to the jury. The merits of a case are not included in an opening statement and a judge will usually exercise great control in making sure that evidence is not included. While great latitude is typically given attorneys in opening arguments, statements of facts and opinions from witnesses usually cannot be mentioned by an attorney. It is improper to tell a jury that evidence will be presented, when, in good conscience, the attorney knows the anticipated evidence will be deemed inadmissible. Again, opening statements are the first chance the jury has to find out about the injured party’s claim. An opening argument typically includes a quick introduction of the type of claim, such that case is a motor vehicle claim, a medical malpractice claim or a slip and fall claim, and may also involve an introduction of the parties. Very generally, it can include the anticipated theories in which an attorney expects a jury to award money to an injured party. An opening statement can also involve a general description of how the accident happened, including dates, locations and times of an accident, and can also include a general description as to the injuries sustained. Further information about opening arguments. In an opening statement there can be comments about anticipated testimony as to medical conditions, surgeries, physical therapy, rehabilitation and other types of treatment that an injured party had to go through or is expected to go through the future. Opening statements can also involve a comment upon the anticipated monetary losses to date, such as medical bills incurred and lost wages incurred to date, as well as a comment upon anticipated future medical bills and future loss of earning capacity. Opening arguments also can involve a general description of anticipated demonstrative evidence such as pictures, video or any other tangible object for the jury’s consideration. Also, it can involve a general description of an injured party’s scarring or physical restrictions or limitations of the injured party. Usually and most importantly, there should be a conclusion at the end of the opening statement. This conclusion is the opportunity to set up the first witnesses that the attorney for the injured party expects to call. It is a way in which the jury can be introduced to the first few witnesses for the injured party so that there is no confusion as to where the case begins. Sign up to receive Jim's E-Newsletter!